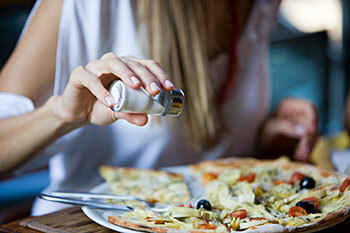 Last week's review article was a look at the state of the research into dietary sodium and its association with blood pressure, heart disease and death from all causes. As the authors noted, most of the research on salt in the diet are observational studies: they can show association, but not causality. That said, some observational studies can be more convincing than others. The difference between the three groups was the bread. The control group received the same type of bread throughout the four weeks of the study. For the second group, the sodium content of the bread was reduced, week by week. [The authors] recruited 74 adult men and women of clinically normal weight to eat their daily lunches from a buffet at the university's on-campus restaurant nearly every day for 5 weeks. A couple of months ago I wrote about Dutch research in sodium reduction that showed that when people weren't informed that their meals had less sodium than they expected, they didn't notice. Generally speaking this does seem to be the case: cutting the amount of salt in bread has had the same results, and research we've done at The Goldring Center for Culinary Medicine (not yet published) suggests that when they're not told that different versions of the same dish are lower in sodium, people actually prefer the lower-sodium versions when asked to directly compare the foods made from the standard recipe with the lower-sodium version. But being an evidence-based physician means considering all of the research, not just the studies that agree with my position. Researchers in South Africa invited 432 adult South Africans to eat a meal of chicken stew (a common South African dish) and give their opinion on the meal, first after an initial taste, then again after finishing however much of the meal they chose to eat (Appetite 2016;96:383-390). The participants were randomly assigned to one of four groups, and each group tasted a different version of the same stew: one made to a commonly-used recipe, one with 10% less sodium than the commonly-used recipe, one with the sodium reduced to a level in line with South African government recommendations for 2016 (a reduction of about 26% from the original), or a version with the sodium reduced by about 47% of the original (the level of South African recommendations for 2019). Each participant only tasted one version of the chicken stew. What is different about this study is that the authors placed salt and pepper shakers on the table for the participants to use if they wished. About 20% of all the participants did choose to add salt to their meals (meaning 80% did not, regardless of which version of the meal they were served). However, the lower the amount of salt in the meal they were served, the more likely they were to choose to add salt at the table - and the more they tended to add, with a few people putting enough salt on their food to bring their meal back up to (and even above) the amount of sodium in the standard version of the dish. Interestingly, at the initial taste they all liked their meal about the same amount, regardless of how much salt was in it. Those who chose to add salt after the initial taste ended up liking their meal less than those who chose not to add salt. You might take this to mean that cutting salt in processed (pre-made) foods would be futile, because at least some people would just add more salt at the table. It's important to note, however, that in this study the authors simply reduced the amount of the salt in the dish - they made no effort to use other culinary techniques to balance the flavors in the dish. Nor did they ask the participants to taste all of the different versions - those tasting the dishes with the least sodium were more likely to add salt at the table because they were used to a much greater amount of salt, comparatively speaking. My take-home here is twofold: first, cut the amount of salt in your diet gradually, and always measure the amount of salt you put in your foods as you cook them. Second, do not add salt at the table. If your food has been cooked with the right amount of salt, you don't need it anyway.